The short of it is that higher STC rating blocks more sound. 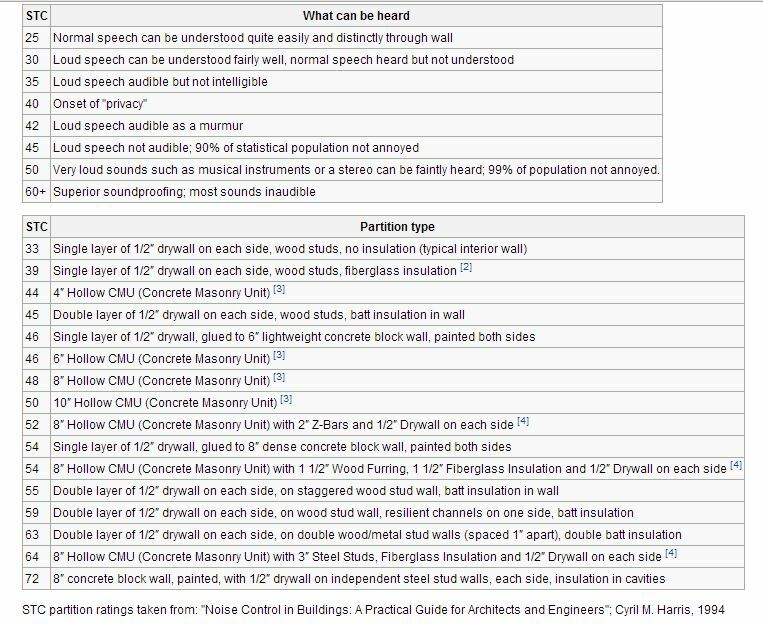 Sound Transmission Class (or STC) is an integer rating of how well a building partition attenuates airborne sound. In the USA, it is widely used to rate interior partitions, ceilings/floors, doors, windows and exterior wall configurations (see ASTM International Classification E413 and E90). Typical interior walls in homes (1 sheet of 1/2″ drywall on either side of a wood stud frame) have an STC of about 33. When asked to rate their acoustical performance, people often describe these walls as “paper thin.” They offer little in the way of privacy. Adding absorptive insulation (e.g., fiberglass batts) in the wall cavity increases the STC to 36-39, depending on stud and screw spacing. Doubling up the drywall in addition to insulation can yield STC 41-45, provided the wall gaps and penetrations are sealed properly. Structurally decoupling the drywall panels from each other (by using resilient channel, a staggered-stud wall, or a double stud wall) can yield an STC as high as 63 or more for a double stud wall (see table below), with good low-frequency transmission loss as well. Compared to the baseline wall of STC 33, an STC 63 wall will transmit only 1/1000 as much sound energy, seem 88 percent quieter and will render most frequencies inaudible. Due to their high mass, concrete and concrete block walls have good TL values (STCs in the 40s and 50s for 4-8″ thickness) but their weight, added complexity of construction, and poor thermal insulation tend to limit them as viable materials in most residential wall construction, except in temperate climates and hurricane or tornado-prone areas. Various insulation options can result in higher STC ratings; however, any insulation tends to add little, compared to other aspects of wall construction. Materials which can improve STCs in walls include mass-loaded vinyl (MLV), “soundproof” drywall (such as QuietRock, Supress, SoundBreak, or ComfortGuard) and damping compounds such as Green Glue. However, the improvement gained by replacing one layer of standard gypsum board with ‘enhanced’ drywall, or similar modest modification, is typically considered only slightly noticeable and not worth the additional cost of such products. To improve sound isolation between spaces, an acoustical consultant that is not affiliated with any manufacturers should be consulted to review the specific situation and provide details to address flanking paths.